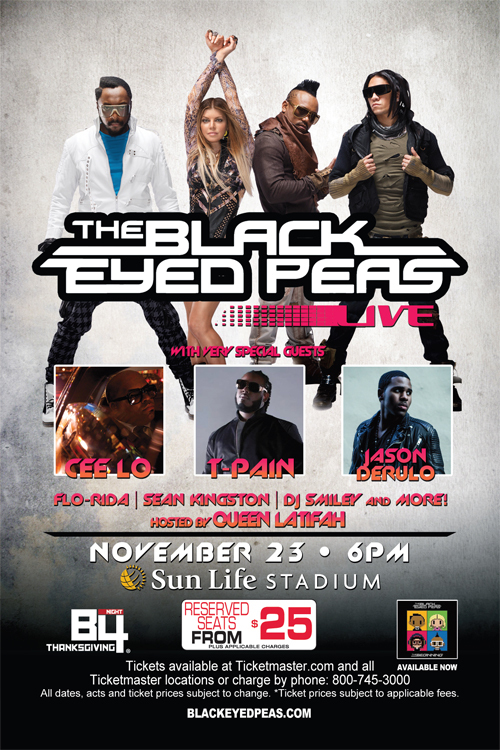 Wednesday, November 23: The Black Eyed Peas return to Miami! Hosted by Queen Latifah – Cee Lo, T-Pain, Jason Derulo, Flo-Rida, Sean Kingston, DJ Smiley & More will be in the House at Sun Life Stadium! Friday, December 2: French Pop sensation “Yelle” brings their “Safari Disco Tour” to the intimate Fillmore Miami Beach at the Jackie Gleason Theatre on Friday, December 2nd, at 8PM. Thanks to Livenation.com I have a few tickets to giveaway to the following concerts. Sign up below for a chance to win! By Signing up you authorize me to add you to my e-mail and text message list.